Don’t let dents and dings keep you from loving your vehicle as you did the day you drove it off the showroom floor. 821 Collision offers paintless dent repair, otherwise referred to as PDR. Paintless dent repair is a method of removing dents from vehicles using specialized the affected vehicle panel and pushing the dent up a little bit at a time, using special tools and a lot of training. 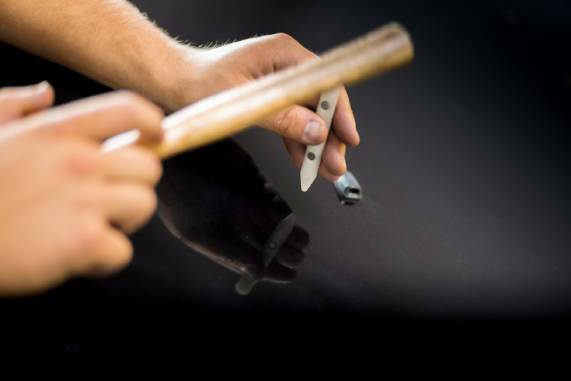 Our accomplished technicians can see movement under the panel the size of a sharpened pencil tip. For minor damages to your vehicle here are just a few reasons why paintless dent repair may be the right solution for you. PDR is a quick process. After the extent of the damage is fully examined and no internal issues have arisen, the body repair technicians can get to work and return your vehicle in pristine condition quickly. Overall cost will depend on the extent of damage but are typically lower than costs associated with alternative auto body repair methods. Keep in mind, the PDR process involves the use of fewer materials, reduced labor hours and less chance other damages will occur during the repair process. This will greatly reflect in the final cost to you. You won’t notice the area of damage our high-level technicians repair. Your vehicle parts will remain intact and will not be replaced or repainted providing the aesthetic look of the vehicle like it was before the accident occurred. There is no filler or paint used during the PDR process. More often than not, insurance companies prefer when PDR is available as an alternative solution because of its cost-effective, quick resolution. Our certified technicians will assist you with your insurance claim ensuring this is the best repair process for your vehicle to bring your car back to its pre-existing condition.